While many people are becoming more accustomed to having a laser used on them during medical procedures such as those performed by an opthamologist or dermatologist or even their family practitioner, they may not be aware that there are more and more procedures that their dentist can now do with a laser as well. Gingival Recontouring—We can make the height of the gingiva more symmetrical from one tooth to the next and can remove gingiva to make your tooth look longer. Removal of Hyperplastic Tissue—This involves trimming overgrown, thick gum tissue without the use of a scalpel. 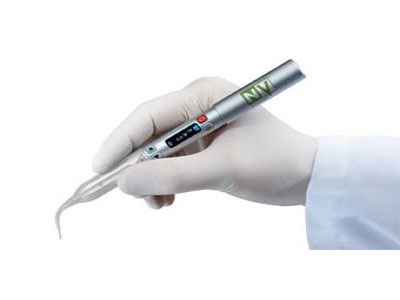 The laser not only trims the gum, but it cauterizes the tissue as well, thereby eliminating the bleeding associated with the scalpel. Treatment of Canker Sores & Cold Sores–Normally one would have to apply a topical ointment to these sores and wait several days for healing to occur, but with a laser we can actually treat these in minutes. The laser helps to reduce the size of the sore and decrease the pain felt from the sore. Operculectomy—This involves removal of excess tissue around a molar or wisdom tooth that if left in place might make it difficult to clean the tooth or might cause you to bite on the tissue. Tooth Exposure—Sometimes we need to remove tissue around a canine or other tooth so the orthodontist can place a bracket and move the tooth into it’s proper position. Frenectomy—This procedure involves the removal of frenum attachments (the thick band of tissue found just below the center of the lip) that can cause gaps between the teeth or difficulty speaking. And there are many more treatments that can be done with the laser. Whatever the procedure, the laser enables us to work faster and more efficiently while exposing the patient to less pain, less bleeding and a shorter healing time. We are excited that the dental laser is enabling us to provide faster, less painful dentistry, which is our mission here at Waterstone.